The Music Player of the Samsung Galaxy Note II is one of the features that makes the phone so appreciated. You can use it to play tracks stored into your phone or on a microSD card and supports most of the existing file formats. Tap on the Apps and you will find Music Player. Your Samsung Galaxy Note II will search for music files stored into device or memory card. 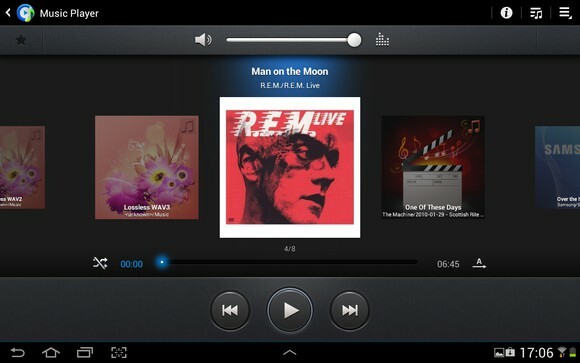 You will find two primary views on your Music Player: the library view and the Now Playing view. Using Library View will allow you to navigate the tabs from the top of your screen. All: lists songs in alphabetical order. Playlists: default playlists and those created by you. Albums: lists all the albums in your collection. Artists: groups all songs and albums under their artist. Music square: create automatic playlists based on your choices. Folders: view the folders containing music on your Samsung galaxy Note II and memory card. Nearby devices: view the music files of nearby devices. By touching Menu key and Thumbnail view, you can switch from default view to a thumbnail view. Just tap on the song you want to play and the Now playing screen it will open. Add to quick list: add the song to the Quick list in the playlists. Via Bluetooth: route the audio to a Bluetooth-enabled headset. Share via: share the song using Bluetooth, Email, Gmail, Messaging, or Wi-Fi. Add to playlist: add the song to a new playlist or an existing playlist. Details: view the details of the current song. Tap Tag to get access the song information. Set as: set the current song as Phone ringtone, Caller ringtones, or Alarm tone. Sound Alive: select from a predefined equalizer setting or create your own custom setting. Music square, Folders, Composers, and Years. Choose which playlist to be viewed: Most played, Recently played, or Recently added. When the feature is selected, a green check mark will appear. Lyrics: select this option to view the song lyrics, if any are available. Music auto off: select the time-frame in which to turn off the music. Choose Custom to select a specific amount of time. End: stops the Music Player and exit out of the application. To continue playing the music in the background, press Home key. Tap Playlists from Music Player application. 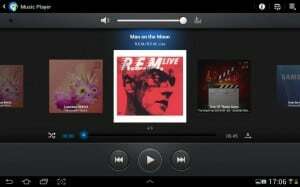 Then, tap the Menu key and Create playlist. Tap the name of your playlist and then OK. Tap Add music option and select your songs and tap Done to save your playlist. Tap Playlists for Music Player app. Tap Menu key and select Add. Tap Remove if you delete a song from your playlist. Tap Edit if you want to rename your playlist. Tap Change order to change the order of playing the songs. This feature is creating playlists according to your preferences. You will simply need to tap a square on the grid and Music square will analyze and create the playlist for you. You can also tap and drag across multiple squares to play multiple songs. You can choose from four tempos available: Exciting, Calm, Joyful and passionate. You can also change the horizontal axis to New and Old by tapping Menu key and selecting Change horizontal axis and then Years. Remember that Music square will be available only if you have minimum 25 songs stored into your phone or memory card. Update your library by tapping the Menu key and Library update. You can quickly access the Music square option by tapping Music square icon found into Now playing screen.